The first-ever global centre combining research and treatment of child abuse opened Jan. 9 at Hebrew University of Jerusalem at Mount Scopus. The Haruv Children’s Campus brings together for the first time, in one location, a comprehensive array of services for abused and neglected children, including emergency treatment, therapeutic facilities and child advocacy assistance. 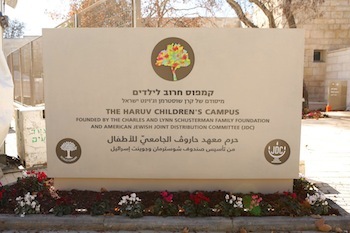 Haruv campus houses seven organizations working on all aspects of identifying, diagnosing and treating children, allowing for increased cooperation and coordination. It is also home to a world-class research centre and training services for a wide range of professionals. This multi-disciplinary campus provides a holistic, child-centred approach to treating, studying and addressing the global issue of child abuse and creates new opportunities for collaboration between institutes and organizations in Israel and around the world. Partnering with the new campus are Hebrew University and the Hadassah Medical Centre. According to the World Health Organization, every fourth child worldwide is a victim of child abuse. Within Israel, about 400,000 youth are considered at-risk for child abuse. In 2015, there were an estimated 44,000 new cases of child abuse reported, with every third Israeli child suffering some form of neglect, 11% involving sexual abuse and 20% involving children with special needs. The problem is so acute that child services workers routinely deal with unmanageable levels of caseloads. The Mount Scopus campus was chosen for its strategic location and general accessibility. The site also offers proximity to the ultra-Orthodox and Arab communities, which predominate in nearby residential areas, and the centre will bring a culturally sensitive approach to its work with these populations. Leading the initiative is the Haruv Institute, with the support of the Charles and Lynn Schusterman Family Foundation, Joint Distribution Committee-Israel, the Ministry of Welfare and Social Affairs, the National Insurance Institute and the Jerusalem Municipality Welfare Services. The campus will house several organizations devoted to dealing with child abuse, including the Schusterman Emergency Centre, the Beit Lynn Child Protection Centre, the Israel National Council for the Child, the Centre for Treatment of Sexually Abused Children, the Israel Medical Stimulation Centre, the Municipal Child Welfare Centre and the Goshen Program for Comprehensive Child Health. The planning and design of the campus reflects its emphasis on addressing the needs of children and families. Throughout the campus, calming elements have been introduced, such as water, pastoral greenery and play areas created from natural materials. The interior spaces have colourful playrooms, work areas that provide privacy, and a school and kindergarten for children at the emergency centre.